The sound coming from a mechanical clock is mainly from the escapement, and produces the familiar ticking sound. 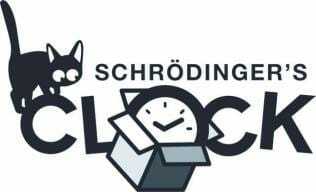 Schrödinger’s Clock™ marks the passing of time with a regular tick-tock to mark each second. This sound is a recording of the escapement in a regulator clock in the Gershom-Parkington collection in Bury St Edmunds, England. The details of this clock are provided below, and we would like to thank St Edmundsbury Heritage Services for this information and for allowing us to make a recording of this regulator clock. An English Regulator timepiece in a solid mahogany case, with a four-legged gravity escapement and zinc and iron compensated pendulum. c. 1880. By James Brock, Portman Square, London. James Brock (died 1881). Brock began work for E J Dent for whom he became workshop foreman and as such was the man who manufactured the Great Westminster Clock (Big Ben). He formed his own company in 1857 and was known as a maker of fine regulators which incorporated the gravity escapements of E B Denison with whom he managed to keep on friendly terms - no easy task given Denison’s eccentric and unpleasant character. The massively constructed weight driven movement has Harrison’s maintaining power and Denison’s four-legged gravity escapement. With this escapement, the pendulum is not maintained in motion directly by the driving weight through the escapement. Instead, the escape wheel lifts two arms on either side of the pendulum and drops them onto the rod giving absolutely equal impulse. The action of the escapement can be seen through the glass panels either side of the hood. The solid mahogany case has a broken arch pediment and glazed door. The hood columns have Corinthian capitals and a magnificent ball and spire finial in gilt and silver. The dial has more in common with those of a century earlier, only the seconds hand at 6 o’clock giving it a more ‘Victorian’ appearance. The movement plates have been ‘spotted’ and the lead pendulum bob has been japanned to give it a polished appearance. The regulator timepiece with its precision movement was the standard timekeeper for astronomers. This one, however, with its finely decorated case was clearly for domestic use. Large houses like the Manor House, would have a regulator which would give the time to all other clocks and watches in the household and it was not unknown for passers-by to call at the tradesman’s entrance to enquire of the footman the correct time by this clock. It seemed appropriate to be able to use this regulator, which had a reputation for providing the correct time (Now), to provide the tick-tock indicating the passing of time, and a state change in Schrödinger’s Clock™. The sound coming from the mechanical clock is mainly from the escapement, that produces the familiar ticking sound. Schrödinger’s Clock™ marks the passing of time with a regular tick-tock to mark each second. This sound is a recording of the escapement in a regulator clock in the Gershom-Parkington collection in Bury St Edmunds, England. The details of this clock are provided below, and we would like to thank St Edmundsbury Heritage Services for this information and for allowing us to make a recording of this regulator clock. An English Regulator timepiece in a solid mahogany case, with a four legged gravity escapement and zinc and iron compensated pendulum. c. 1880. By James Brock, Portman Square, London. The massively constructed weight driven movement has Harrison’s maintaining power and Denison’s four legged gravity escapement. With this escapement, the pendulum is not maintained in motion directly by the driving weight through the escapement. Instead, the escape wheel lifts two arms on either side of the pendulum and drops them onto the rod giving absolutely equal impulse. The action of the escapement can be seen through the glass panels either side of the hood. It seemed appropriate to be able to use this regulator, which had a reputation for providing the correct time, to provide the tick-tock indicating a state change in Schrödinger’s Clock™.